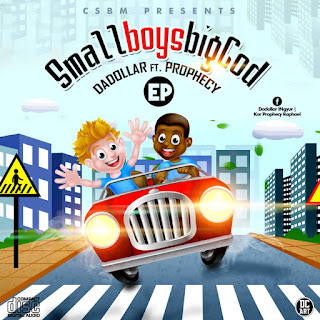 Benue based Nigerian Christian Hiphop artist Dadollar and Prophecy are here with a project titled, Small Boys Big God. Small Boys Big God is an Ep album (joint), having Dadollar from CSBM featuring Prophecy from WSCBM. Other artist featured on the Ep are Vi preacher, the CEO Vi Music Empire, a singer, rapper and performing artist. Lilmizzy who is CEO Gospelhints, CSBM label artist and also the prince of Big daddy records. The Ep was produced by Gospelhints and Vi Music Empire. Mixed and mastered by Sweet Savy and Vi mix, also promoted by Voegist.com.ng.